Viktor Andriyovych Yushchenko (Ukrainian: Віктор Андрійович Ющенко, IPA: [ˈβiktor ɐnˈdrʲijoβetʃ ˈjuʃtʃenko] ( listen); born 23 February 1954) is a Ukrainian politician who was the third President of Ukraine from 23 January 2005 to 25 February 2010. As an informal leader of the Ukrainian opposition coalition, he was one of the two main candidates in the 2004 Ukrainian presidential election. Yushchenko won the presidency through a repeat runoff election between him and Prime Minister Viktor Yanukovych. The Ukrainian Supreme Court called for the runoff election to be repeated because of widespread electoral fraud in favor of Viktor Yanukovych in the original vote. Yushchenko won in the revote (52% to 44%). Public protests prompted by the electoral fraud played a major role in that presidential election and led to Ukraine's Orange Revolution. Following an assassination attempt in late 2004 during his election campaign, Yushchenko was confirmed to have ingested hazardous amounts of TCDD, the most potent dioxin and a contaminant in Agent Orange. He suffered disfigurement as a result of the poisoning, but has since made a full physical recovery. Before his election as president, Yushchenko already had a career in Ukrainian politics. In 1993, he became governor (head) of the National Bank of Ukraine. From 1999 to 2001 he was prime minister. After his dismissal as prime minister, Yushchenko went into opposition to President Leonid Kuchma and he founded the Our Ukraine bloc, which at the 2002 parliamentary election became Ukraine's most popular political force, with 23.57% of the votes. After Yushchenko's election in 2004 to the presidency, this alliance was unable to continue this success, garnering only 13.95% of the votes in 2006 and 14.15% of the votes in the 2007 parliamentary election. 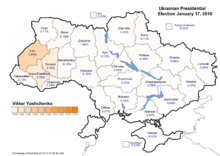 Yushchenko failed to secure a run-off spot during the 2010 Ukrainian presidential election; gaining 5.5% of the vote. During the 2012 Ukrainian parliamentary elections, Yushchenko headed the election list of Our Ukraine. The party won 1.11% of the national votes and no constituencies, and thus failed to win parliamentary representation. Viktor Andriyovych Yushchenko was born on 23 February 1954, in Khoruzhivka, Sumy Oblast, Ukrainian SSR, Soviet Union, into a family of teachers. His father, Andriy Andriyovych Yushchenko (1919–1992), fought in the Second World War, was captured by German forces and imprisoned as a POW in a series of concentration camps in the German Reich, including Auschwitz-Birkenau. He survived the ordeal, and after returning home, taught English at a local school. Viktor's mother, Varvara Tymofiyovna Yushchenko (1918–2005), taught physics and mathematics at the same school. The Sumy Oblast region where he was born is predominantly Ukrainian-speaking, and this differentiated him in later life from his political counterparts, for whom Russian was the mother tongue. Viktor Yushchenko graduated from the Ternopil Finance and Economics Institute in 1975 and began work as an accountant, as a deputy to the chief accountant in a kolkhoz. Then, from 1975 to 1976, he served as a conscript in the Transcaucasian Military District on the Soviet–Turkish border. In 1976 Yushchenko began a career in banking. In 1983, he became the Deputy Director for Agricultural Credit at the Ukrainian Republican Office of the Soviet Union State Bank. From 1990 to 1993, he worked as vice-chairman and first vice-chairman of the JSC Agroindustrial Bank Ukraina. In 1993, he was appointed Governor of the National Bank of Ukraine (Ukraine's central bank). In 1997, Verkhovna Rada, the parliament of Ukraine, re-appointed him. As a central banker, Yushchenko played an important part in the creation of Ukraine's national currency, the hryvnia, and the establishment of a modern regulatory system for commercial banking. He also successfully overcame a debilitating wave of hyper-inflation that hit the country—he brought inflation down from more than 10,000 percent to less than 10 percent—and managed to defend the value of the currency following the 1998 Russian financial crisis. In 1998, he wrote a thesis entitled "The Development of Supply and Demand of Money in Ukraine" and defended it in the Ukrainian Academy of Banking. He thereby earned a doctorate in economics. In December 1999, Ukrainian President Leonid Kuchma unexpectedly nominated Yushchenko to be the prime minister after the parliament failed by one vote to ratify the previous candidate, Valeriy Pustovoytenko. Ukraine's economy improved during Yushchenko's cabinet service. However, his government, particularly Deputy Prime Minister Yulia Tymoshenko, soon became embroiled in a confrontation with influential leaders of the coal mining and natural gas industries. The conflict resulted in a 2001 no-confidence vote by the parliament, orchestrated by the Communists, who opposed Yushchenko's economic policies, and by centrist groups associated with the country's powerful "oligarchs." The vote passed 263 to 69 and resulted in Yushchenko's removal from office. Yushchenko's approval rating stood at 7% as of October, 2009 according to FOM-Ukraine polling results. In 2002, Yushchenko became the leader of the Our Ukraine (Nasha Ukrayina) political coalition, which received a plurality of seats in the year's parliamentary election. However, the number of seats won was not a majority, and efforts to form a majority coalition with other opposition parties failed. Since then, Yushchenko has remained the leader and public face of the Our Ukraine parliamentary faction. In 2001, both Yushchenko and Yulia Tymoshenko broached at creating a broad opposition bloc against the incumbent President Leonid Kuchma in order to win the Ukrainian presidential election 2004. In late 2002 Yushchenko, Oleksandr Moroz (Socialist Party of Ukraine), Petro Symonenko (Communist Party of Ukraine) and Yulia Tymoshenko (Yulia Tymoshenko Bloc) issued a joint statement concerning "the beginning of a state revolution in Ukraine". Though the communists stepped out of the alliance and though Symonenko opposed having one single candidate from the alliance in the 2004 presidential election, the other three parties remained allies until July 2006. On 2 July 2004 Our Ukraine and the Yulia Tymoshenko Bloc established the Force of the people, a coalition which aimed to stop "the destructive process that has, as a result of the incumbent authorities, become a characteristic for Ukraine", at the time President Kuchma and Prime Minister Viktor Yanukovych were the incumbent authorities in Ukraine. The pact included a promise by Viktor Yushchenko to nominate Tymoshenko as Prime Minister if Yushchenko would win the October 2004 presidential election. Yushchenko was widely regarded as the moderate political leader of the anti-Kuchma opposition, since other opposition parties were less influential and had fewer seats in parliament. Since becoming President of Ukraine in 2005, he has been an honorary leader of the Our Ukraine party. From 2001 to 2004, his rankings in popularity polls were higher than those of President Leonid Kuchma. In later public opinion polls, though, his support plummeted from a high of 52% following his election in 2004 to below 4%. However, in the parliamentary elections of March 2006, the Our Ukraine party, led by Prime Minister Yuriy Yekhanurov, received less than 14% of the national vote, taking third place behind the Party of Regions and the Yulia Tymoshenko Bloc. In a poll by the Sofia Social Research Centre between 27 July and 7 August 2007 more than 52% of those polled said they distrusted Yushchenko. In 2004, as President Kuchma's term came to an end, Yushchenko announced his candidacy for president as an independent. His major rival was Prime Minister Viktor Yanukovych. Since his term as prime minister, Yushchenko had slightly modernized his political platform, adding social partnership and other liberal slogans to older ideas of European integration, including Ukraine's joining NATO and fighting corruption. Supporters of Yushchenko were organized in the "Syla Narodu" ("Power to the People") electoral coalition, which he and his political allies led, with the Our Ukraine coalition as the main constituent force. Yushchenko built his campaign on face-to-face communication with voters, since the government prevented most major TV channels from providing equal coverage to candidates. Meanwhile, his rival, Yanukovych, frequently appeared in the news and even accused Yushchenko, whose father was a Red Army soldier imprisoned at Auschwitz, of being "a Nazi," even though Yushchenko actively reached out to the Jewish community in Ukraine and his mother is said to have risked her life by hiding three Jewish girls for one and a half years during the Second World War. Yushchenko at the University of Amsterdam, with chloracne from TCDD poisoning (2006). The campaign was often bitter and violent. Yushchenko became seriously ill in early September 2004. He was flown to Vienna's Rudolfinerhaus clinic for treatment and diagnosed with acute pancreatitis, accompanied by interstitial edematous changes, due to a serious viral infection and chemical substances that are not normally found in food products. Yushchenko claimed that he had been poisoned by government agents. After the illness, his face was greatly disfigured: jaundiced, bloated, and pockmarked. British toxicologist Professor John Henry of St Mary's Hospital in London declared the changes in Yushchenko's face were due to chloracne, which results from dioxin poisoning. Dutch toxicologist Bram Brouwer also stated his changes in appearance were the result of chloracne, and found dioxin levels in Yushchenko's blood 6,000 times above normal. On 11 December, Dr. Michael Zimpfer of the Rudolfinerhaus clinic declared that Yushchenko had ingested TCDD dioxin and had 1,000 times the usual concentration in his body. Many have linked Yushchenko's poisoning to a dinner with a group of senior Ukrainian officials (including Volodymyr Satsyuk) that took place on 5 September. Since 2005, Yushchenko has been treated by a team of doctors led by Professor Jean Saurat at the University of Geneva Hospital. Analysis of Yushchenko's body fluids and tissues provided useful information on the human toxicokinetics of TCDD and its metabolites. Yushchenko himself implicated David Zhvania, the godfather of one of his children, of involvement in his dioxin poisoning. In August 2009, The Lancet published a scientific paper by Swiss and Ukrainian researchers on the monitoring, form, distribution, and elimination of 2,3,7,8-Tetrachlorodibenzodioxin (TCDD) in Yushchenko in relation to his severe poisoning. The 2004 TCDD levels in Yushchenko's blood serum were 50,000-fold greater than those in the general population. This new study also concluded that the dioxin "was so pure that it was definitely made in a laboratory". On 27 September 2009 Yushchenko said in an interview aired on Channel 1+1 that the testimony of three men who were at a dinner in 2004 at which he believes he was poisoned is crucial to finishing the investigation, and he claimed these men were in Russia. Ukrainian prosecutors said Russia has refused to extradite one of the men, the former deputy chief of Ukraine's security service, Volodymyr Satsyuk, because he holds both Russian and Ukrainian citizenship. After arriving in Russia Satsyuk was granted Russian citizenship protecting him from extradition. The initial vote, held on 31 October 2004, saw Yushchenko obtain 39.87% of vote, ahead of his opponent Yanukovych with 39.32%. Because neither candidate reached the 50% majority required for outright victory, a second round of run-off voting was held on 21 November 2004. Although a 75% voter turnout was recorded, observers reported many irregularities and abuses across the country, such as organized multiple voting and extra votes for Yanukovych after the polls closed. Exit poll results put Yushchenko ahead in the western and central provinces of the country, and one poll gave him an 11% margin of victory. However, the final official result was a 3% margin of victory for Yanukovych. The allegations of electoral fraud and the discrepancy between exit polls and the final tally prompted Yushchenko and his supporters to refuse to recognize the results. After thirteen days of massive popular protests in Kiev and other Ukrainian cities that became known as the Orange Revolution, the Supreme Court overturned the election results and ordered a re-vote of the run-off election for 26 December. Yushchenko proclaimed a victory for the opposition and declared his confidence that he would be elected with at least 60% of the vote. He did win the re-vote of second round, but with 52% of the vote. Yushchenko meeting then-United States President George W. Bush at an April 2005 press conference. The first 100 days of Yushchenko's term, 23 January 2005 through 1 May 2005, were marked by numerous dismissals and appointments at all levels of the executive branch. He appointed Yulia Tymoshenko as Prime Minister and the appointment was ratified by parliament. Oleksandr Zinchenko was appointed the head of the presidential secretariat with a nominal title of Secretary of State. Petro Poroshenko, a fierce competitor of Tymoshenko for the post of Prime Minister, was appointed Secretary of the Security and Defense Council. May 2005 saw Ukraine host the Eurovision Song Contest in the capital of Kiev. Some accused Yushchenko of attempting to gain political capital from the event, with his appearance on stage at the end criticised as 'undignified' by certain commentators. During 2005, Yushchenko was in confident mood, making such pledges as solving the Gongadze case to the removal of Russia's Black Sea Fleet. In August 2005, Yushchenko joined with Georgian President Mikheil Saakashvili in signing the Borjomi Declaration, which called for the creation of an institution of international cooperation, the Community of Democratic Choice, to bring together the democracies and incipient democracies in the region around the Baltic, Black, and Caspian Seas. The first meeting of presidents and leaders to discuss the CDC took place on December 1–2, 2005 in Kiev. According to former Security Service of Ukraine Chairman Oleksandr Turchynov, Yushchenko prevented in the summer of 2005 an investigation into allegedly fraudulent practices in the transport of Turkmen natural gas to Ukraine and the arrest of Yuri Boyko for abuse of office while heading Naftogaz. On 8 September 2005, Yushchenko fired his government, led by Yulia Tymoshenko, after resignations and claims of corruption. On 9 September, acting Prime Minister Yuriy Yekhanurov tried to form a new government. His first attempt, on 20 September, fell short by 3 votes of the necessary 226, but on 22 September the parliament ratified his government with 289 votes. Also in September 2005, former president Leonid Kravchuk accused exiled Russian tycoon Boris Berezovsky of financing Yushchenko's presidential election campaign, and provided copies of documents showing money transfers from companies he said were controlled by Berezovsky to companies controlled by Yushchenko's official backers. Berezovsky confirmed that he met Yushchenko's representatives in London before the election, and that the money was transferred from his companies, but he refused to confirm or deny that the money was used in Yushchenko's campaign. Financing of election campaigns by foreign citizens is illegal in Ukraine. On 2 April 2007, Yushchenko signed an order to dissolve the parliament and call early elections. Some consider the dissolution order illegal because none of the conditions spelled out under Article 90 of the Constitution of Ukraine for the president to dissolve the legislature had been met. Yushchenko's detractors argued that he was attempting to usurp the functions of the Constitutional Court by claiming constitutional violations by the parliament as a pretext for his action; the parliament appealed the Constitutional Court itself and promised to abide by its ruling. In the meantime, the parliament continued to meet and banned the financing of any new election pending the Constitutional Court's decision. 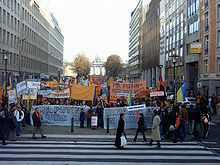 Competing protests took place and the crisis escalated. In May 2007, Yushchenko illegally dismissed three members of Ukraine's Constitutional Court, thus preventing the court from ruling on the constitutionality of his decree dismissing Ukraine's parliament. Yushchenko again tried to dissolve the parliament on 9 October 2008 by announcing parliamentary elections to be held on December 7. Yushchenko's decree was suspended and has since lapsed. Yushchenko in defense of his actions said, "I am deeply convinced that the democratic coalition was ruined by one thing alone—human ambition. The ambition of one person." Political groups including members of his own Our Ukraine party contested the election decree and politicians vowed to challenge it in the courts. In December 2008, following a back room revolt from members of Our Ukraine-Peoples' Self Defense Party a revised coalition was formed between members of Our Ukraine–People's Self-Defense Bloc (OU-PSD), the Bloc of Yulia Tymoshenko (BYuT), and the Lytvyn Bloc (LB), increasing the size of the governing coalition by an additional 20 members. Yushchenko in responding to journalists questions claimed "The fact is that the so-called coalition was formed on basis of political corruption, this coalition will be able to work only if the Communist Party will join it. Speaking about such a type of coalition, it is even more shameful." Victor Yushchenko also stated that Yulia Tymoshenko's desire to keep her job as Prime Minister was the main motive for creating the coalition and that he wanted to expel the OU-PSD lawmakers who supported the creation of the coalition from the list of members of parliament. Yushchenko claimed (19 March 2009) that his conflicts with Tymoshenko are not due to personal differences, but to the incompleteness of the constitutional reforms of 2004. On 23 July 2009, under the terms of Ukraine's Constitution the president cannot dismiss the parliament within six months from the expiration of his five-year term of authority, which ends on 23 January 2010. On 10 November 2009, Viktor Yushchenko was nominated for a second term as President, with the election to be held on 17 January 2010. In late November 2009 he stated he was going to leave politics after his second term run. During the campaign Yushchenko stated his fellow candidates "Tymoshenko and Yanukovych are not the ideologists who care about the fate of Ukraine and its interests. These are two political adventurers" and that Ukraine's independence and sovereignty was at the time more jeopardized than five to ten years earlier. The first round of elections took place on 17 January 2010, and Yushchenko collapsed to a distant fifth place with only 5.45% of the vote. His result became the worst result for any sitting President in history. Yushchenko stated that he wants to continue to defend democracy in Ukraine and that he wants to return to the presidential post. On 22 January 2010, as outgoing President of Ukraine Yushchenko officially rehabilitated one of Ukraine's most controversial World-War-II-era figures, the ultranationalist leader Stepan Bandera and awarded him the title of Hero of Ukraine. The Organization of Ukrainian Nationalists even set up multi national assemblies of the occupied peoples of the Soviet union in which more than 12 Soviet Republics were represented, such as Kazakhstan, Belarus, Uzbekistan, Russia and others.. Yushchenko's decision immeditately caused an uproar and was condemned by European Parliament, Russian, Polish and Jewish organizations, and was declared illegal by the following Ukrainian government and a court decision in April 2010. In January 2011, the award was officially annulled. In the second round of Ukraine's presidential elections Yushchenko didn't support either of the candidates, Victor Yanukovych or Yulia Tymoshenko. Yushchenko didn't attend the inauguration ceremony of President Yanukovych. On 10 March 2010 Yushchenko indicated his future plans would largely depend on Yanukovych's performance. A day earlier, Yushchenko's former ally turned rival, Yulia Tymoshenko, took up the mantle as leader of the democratic opposition. But Yushchenko warned that her leadership will end in disaster, noting, "Every political force that united with Tymoshenko ended badly." On 31 May 2010 Yushchenko stated that Yulia Tymoshenko was his "worst mistake": "The most serious mistake was to give the power to her twice". On 18 April 2010, Yushchenko and his wife (along with President Yanukovych and former Prime Minister Tymoshenko) journeyed to Poland to attend the state funeral of President Lech Kaczyński in Kraków. Due to the widespread air disruptions in Europe due to the eruptions in Iceland, the Yushchenkos journeyed by car from Kiev. Yushchenko testified against his former ally Yulia Tymoshenko during her trial over a 2009 natural gas treaty she brokered with Russia; a trial he called "a normal judicial process". Yushchenko's view differed from that of the EU foreign policy chief Catherine Ashton, who said in a statement the Tymoshenko verdict showed justice was being applied "selectively in politically motivated prosecutions". Late September 2011 Yushchenko stated he intended to run for parliament on an Our Ukraine party ticket at the 2012 Ukrainian parliamentary elections. Mid-February 2012 Yushchenko stated he was ready to take part in this election on a list of the united opposition, but not in a majority constituency. In these election Yushchenko headed the election list of Our Ukraine; the party won 1.11% of the national votes and no constituencies and thus failed to win parliamentary representation. In February 2013 Yushchenko intended to be a candidate during the next presidential election (at the time scheduled to be in 2015). In an interview with the French radio station Europe 1 in March 2014, Yushchenko stated that he supported the Euromaidan protests and opposed the Russian intervention in Crimea, noting that in his view "Putin dreams of reconstructing the Soviet empire under the name of Russia. He is so obsessed with this that he hasn't understood power balance." He further stated that "Crimea isn't Russian; rather it is Ukrainian". With regard to the 2014 Presidential elections, Yushchenko indicated his support for Vitali Klitschko, and described Tymoshenko as "the candidate of Moscow". Yushchenko himself did not stand as a candidate in these elections. On 31 March 2009, in his address to the nation before Parliament, Yushchenko proposed sweeping government reform changes and an economic and social plan to ameliorate current economic conditions in Ukraine and apparently to respond to standing structural problems in Ukraine's political system. Yushchenko also advocates NATO membership for Ukraine and is against promoting Russian as the second state language in Ukraine. According to Yushchenko, a good future for the country is impossible without national unity. Yushchenko also advocates the formation of a single Orthodox Church in Ukraine, thus unifying the current three branches of the Orthodox church in Ukraine (the Ukrainian Orthodox Church of Moscow Patriarchate, the only one recognized by the world orthodox community, the Ukrainian Orthodox Church of Kyiv Patriarchate and the Ukrainian Autocephalous Orthodox Church). Actions by the Ukrainian Insurgent Army have been praised by Yushchenko, and he has tried to give anti-Soviet partisans who fought in World War II the status of war veterans. According to Yushchenko the difficulties of relations between Ukraine and Russia are because the countries follow different directions and have different system of values. Yushchenko thinks that "the Russia-Georgia war of August 2008 poses a threat that European leaders still haven’t addressed". He has called for a demarcation of borders between Russia and Ukraine, which has been delayed by Russia since Ukraine won independence from the Soviet Union in 1991. During the campaign for the Ukrainian presidential election, 2010 Yushchenko said Russia's influence was again a factor in the upcoming election and warned of "interference" from Moscow in the distribution of Russian passports to residents of Crimea. He has also stated (on 10 December 2009) "Russia is a friendly country and that it would be a great mistake for Ukraine to lose these relations or to slow down their development; I believe that there will appear politicians in Russia, who will respect the rights of all neighbors, including Ukraine". Yushchenko's 2010 presidential election program promised visa-free travel with EU, the withdrawal of the Black Sea Fleet of the Russian Federation by 2017 and "an active dialogue with all of Ukraine's neighbours based on the principles of equal rights, good neighbourly relations and mutual trust", but did not mention NATO membership. Yushchenko also believed that the 2008–2009 Ukrainian financial crisis could be tackled with the help of reconstruction, including road reconstruction. Furthermore, the program banned tax collection in advance, would return non-reimbursed VAT, create equal tax rules for everybody and stop government interference in certain enterprises and whole sectors of the economy. Yushchenko considers an open list of candidates for parliamentary elections as one of the conditions for eradicating corruption. Vitalyna (b. 15 April 1980) currently married to Oleksiy Khakhlyov and has two children. In 1998, he married Kateryna Chumachenko, with whom he has three children. She is a Ukrainian-American born in Chicago who received a degree in Economics from Georgetown University and an MBA from the University of Chicago. She also studied at the Ukrainian Institute at Harvard University. Her resume includes working for the Ukrainian Congress Committee of America, the Bureau for Human Rights and Humanitarian Affairs at the U.S. State Department, the Reagan White House, the U.S. Treasury Department, and the Joint Economic Committee of Congress. In Ukraine she first worked with the US-Ukraine Foundation, then as Country Director for KPMG Barents Group. She heads the Ukraine 3000 Foundation, which emphasizes promoting civil society, particularly charity and corporate responsibility. The Foundation implements programs in the areas of children's health, integrating the disabled, improving education, supporting culture and the arts, publishing books, and researching history, particularly the Holodomor. From 1995 to 2005, she worked closely with Pryately Ditey, an organization that helps Ukrainian orphans. Criticized by her husband's opponents for her US citizenship, Kateryna became a Ukrainian citizen in March 2005 and renounced her US citizenship, as required by Ukrainian law, in March 2007. During the 2004 election campaign, she was accused of exerting influence on behalf of the U.S. government on her husband's decisions, as an employee of the U.S. government or even a CIA agent. A Russian state television journalist had earlier accused her of leading a U.S. project to help Yushchenko seize power in Ukraine; in January 2002, she won a libel case against that journalist. Ukraine's then anti-Yushchenko TV channel Inter repeated the allegations in 2001, but in January 2003 she won a libel case against that channel. A practicing member of the Ukrainian Orthodox Church, Yushchenko often emphasizes the important role of his religious convictions in his life and worldview. Yushchenko has been criticized for using many words of Russian origin when speaking Ukrainian. His main hobbies are Ukrainian traditional culture (including art, ceramics, and archaeology), mountaineering, and beekeeping. He is keen on painting, collects antiques, folk artifacts, and Ukrainian national dress, and restores objects of Trypillya culture. Each year he climbs Hoverla, Ukraine's highest mountain. After receiving a checkup in which doctors determined he was healthy despite the previous year's dioxin poisoning, he successfully climbed the mountain again on 16 July 2005. Although Yushchenko does not work for the Ukrainian state anymore, as a former president of Ukraine he continues to live in his state-owned dacha in Koncha-Zaspa. As a politician, Viktor Yushchenko is widely perceived as a mixture of Western-oriented and Ukrainian nationalist. He advocates moving Ukraine in the direction of Europe and NATO, promoting free market reforms, preserving Ukraine's culture, rebuilding important historical monuments, and remembering Ukraine's history, including the Holodomor famine of 1932–1933. His opponents (and allies) sometimes criticize him for indecision and secrecy, while advocates call the same attributes signs of Yushchenko's commitment to teamwork, consensus, and negotiation. He is also often accused of being unable to form a unified team free of inner quarrels. United States Ambassador to Ukraine John F. Tefft described Yushchenko, in a document uncovered during the United States diplomatic cables leak, as discredited among the population because of his weakness of leadership, continuous conflicts with Yulia Tymoshenko, needless hostility towards Russia and his NATO ambitions. Yushchenko's former-Minister of Internal Affairs Yuriy Lutsenko accused Yushchenko of betraying the Orange Revolution and bringing Viktor Yanukovych to power. In December 2011 Russian Prime Minister Vladimir Putin claimed that the organizers of the 2011 Russian protests were former (Russian) advisors to Yushchenko during his presidency and were transferring the Orange Revolution to Russia. In 2008 Viktor Yushchenko's popularity plunged to less than 10%. According to a poll carried out by the Kyiv International Institute of Sociology between January 29 and 5 February 2009, just under 70% of Ukrainian voters believed that Yushchenko should leave his post, whereas just over 19% believed he should stay. When asked if Yushchenko should be impeached, over 56% of those polled were in favor with almost 27% against. According to a public opinion poll conducted by FOM-Ukraine in September/October 2009, 88.5% of those polled did not support the actions of Yushchenko as president, while 6.7% welcomed them. A Razumkov Center opinion poll conducted in October 2011 told that 80% of Ukrainians did not support his actions; it was the highest negative rating of any Ukrainian politician. Named Man of the Year 2004 by Wprost. Included in the 2005 Time 100, an annual list of the 100 most influential people in the world, as assembled by Time. ^ BBC (13 January 2010). "Profile: Viktor Yushchenko". BBC. ^ a b c Cronin, David (March 5, 2005). "Orange Revolutionary". Politico Europe. Retrieved December 17, 2018. ^ "Half of Ukrainians ready to deprive Yushchenko of presidency". ForUm News agency. 2007-08-15. Archived from the original on 2007-09-29. ^ Andersen, Elizabeth (2002-12-03). "Open Letter to the Speaker of the Verhkovna Rada of Ukraine Volodymyr Lytvyn and Deputies of the Verkhovna Rada of Ukraine". Human Rights Watch. ^ "Temniki. No comments" (in Ukrainian). Ukrayinska Pravda. 2004-07-06. Archived from the original on 2007-09-30. Requests from Administration of President Kuchma to media. ^ Maksymiuk, Jan (2003-11-16). "Hard lessons for Our Ukraine in Donetsk". The Ukrainian Weekly. Archived from the original on 2007-09-30. ^ Haslett, Malcolm (2005-01-28). "Yushchenko's Auschwitz connection". BBC News. ^ a b "Yushchenko and the poison theory". BBC News. 2004-12-11. ^ a b "Yushchenko: 'Live And Carry On'". CBS News. 2005-01-30. ^ a b Dougherty, Jill (December 11, 2004). "Doctors: Yushchenko was poisoned". CNN. Archived from the original on 2007-02-18. Retrieved 2007-04-02. ^ "Doctor: Yushchenko in 'very good' health". USA Today. 2005-07-18. ^ a b O Sorg; M Zennegg; P Schmid; R Fedosyuk; R Valikhnovskyi; O Gaide; V Kniazevych; J-H Saurat (2009). "2,3,7,8-tetrachlorodibenzo-p-dioxin (TCDD) poisoning in Victor Yushchenko: identification and measurement of TCDD metabolites". The Lancet. 374 (9696): 1179–85. doi:10.1016/S0140-6736(09)60912-0. PMID 19660807. ^ Bill Meyer (2009-07-24). "Ukraine president blames former ally for poisoning". Retrieved 2010-02-11. ^ "Yushchenko to Russia: Hand over witnesses". Kyiv Post. 2009-10-28. Retrieved 2010-02-11. ^ Boris Volodarsky (2010). KGB's Poison Factory: From Lenin to Litvinenko. MBI Publishing Company. p. 116. Archived from the original on 30 June 2014. Retrieved 14 March 2014. ^ "TURKMEN DELEGATION IN KIEV TO ATTEND UKRAINIAN PRESIDENT INAUGURATION | Turkmenistan.ru". www.turkmenistan.ru. Retrieved 2017-09-24. ^ Nicholas (2005-05-27). "Kiev Ukraine News Blog: Kiev Counts Cost of Eurovision Hosting". News.kievukraine.info. Retrieved 2014-03-16. ^ Nicholas (2005-12-20). "Kiev Ukraine News Blog: Ukraine Raises Russia's Black Sea Fleet Issue in Gas Row". News.kievukraine.info. Retrieved 2014-03-16. ^ "Ukraine president dissolves Parliament and calls for elections". International Herald Tribune. 2007-04-02. ^ "On stopping ahead of schedule powers of Verhovna Rada of Ukraine". Order of President of Ukraine (in Ukrainian). 2007-04-02. ^ "Supreme Court Restores Stanik As Constitutional Court Judge". Ukrainian News agency. 2008-03-27. Archived from the original on 2008-05-09. ^ "reuters.com, Ukraine president sets parliament election for Dec 7". In.reuters.com. Retrieved 2014-03-16. ^ "Yushchenko registered as a nominee for presidential election". ForUm. Archived from the original on 2009-11-03. Retrieved 2009-10-27. ^ "УКАЗ ПРЕЗИДЕНТА УКРАИНЫ № 46/2010: О присвоении С.Бандере звания Герой Украины" [DECREE OF THE PRESIDENT OF UKRAINE No. 46/2010: On conferring the title of Hero of Ukraine to S. Bander]. President of Ukraine (in Ukrainian). January 22, 2010. Archived from the original on January 25, 2010. Retrieved February 23, 2016. ^ "Russia condemns Yushchenko for declaring Bandera a Hero of Ukraine". Voice of Russia. January 26, 2010. Archived from the original on November 14, 2012. Retrieved May 3, 2012. ^ Narvselius, Eleonora (2012). "The 'Bandera Debate': The Contentious Legacy of World War II and Liberalization of Collective Memory in Western Ukraine". Canadian Slavonic Papers. 54 (3–4): 469–490. ISSN 0008-5006. ^ Рішенням суду президентський указ «Про присвоєння С.Бандері звання Герой України» скасовано Archived January 15, 2011, at the Wayback Machine, President.gov.ua. Retrieved January 16, 2011. ^ "Мнбнярх Сйпюхмш Newsru.Ua :: Мюжхнмюкэмюъ Хдеъ Ме Онрепоекю Онпюфемхе Б Оепбнл Рспе Бшанпнб Опегхдемрю, Явхрюер Чыемйн". Txt.rus.newsru.ua. Archived from the original on 2014-03-17. Retrieved 2014-03-16. ^ "European leaders prepare for long drive for Lech Kaczyński's funeral". news.com.au. 18 April 2010. Retrieved 18 April 2010. "Viktor Yushchenko: 'Putin jamás logrará poner de rodillas a Ucrania'". El Mundo. 3 March 2014. ^ "'Yushchenko pushes for official recognition of OUN-UPA combatants'". Zik.com.ua. 2008-01-11. Retrieved 2014-03-16. ^ "Московский комсомолец: Семья - не рада, Ющенко - не тесть (компромат)". Korrespondent.net. Retrieved 2014-03-16. Wikimedia Commons has media related to Viktor Yushchenko. Сandidate Viktor Yushchenko wins first round of Ukraine election (10 November 2004). Rule of Law Foundation. Ukrainian folk, or how WW2 veterans dieing in Ukraine ! Stephen Velychenko (November 13, 2009). "Yushchenko's Place in History: A Leader who Failed his People?". SpectreZine.org. Retrieved August 22, 2016.